Across the sea of imagination, in the land of “Once Upon a Time,” there exists the island home of Faery Tales. 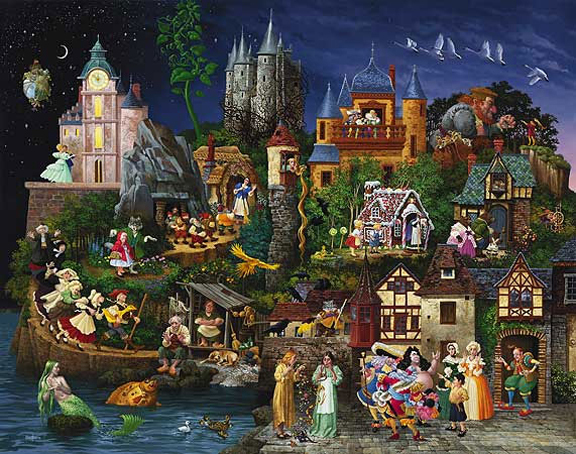 James Christensen gives us a glimpse into the daily life of twenty-four of the world’s most popular stories. The Emperor is resplendent in his new clothes, Cinderella dances with her Prince, the Three Bears return home to find an unexpected guest and Rapunzel lets her hair down. How many others do you recognize? All generations of any family can find common ground in this bright and cheery ode to the ever fascinating, fantasy world of our youth. Teach your children or grandchildren your favorites and learn some new ones at the same time! Included with each print or canvas is a key to all the faery tales in the image.